Whoohoo!! 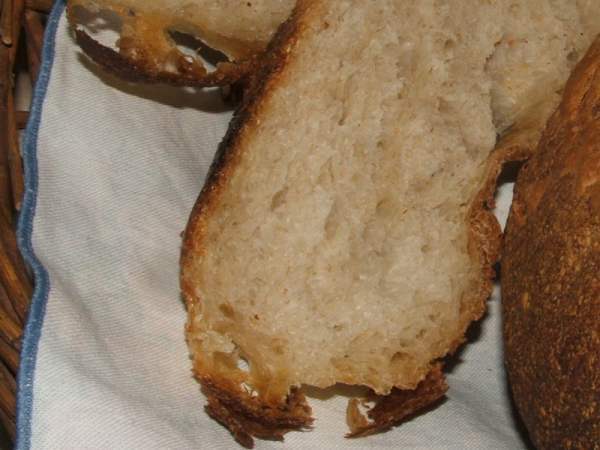 Wild Bread that ISN'T sour! I did it!!! I did it!!! After weeks of angst with babying my jar of wild yeast, feeling I would never be able to bake a loaf of bread that WASN'T sour (not to mention the several times I was going to throw in the towel altogether), I have achieved my goal. Not only was it not too sour; it wasn't sour at all! And it was light!! Light as a feather!! And kept at it for days until finally finally, it began to look like a real starter again. I like to balance cookie cutter(s) on top of the just shaped bread to etch a design in top of the loaf. 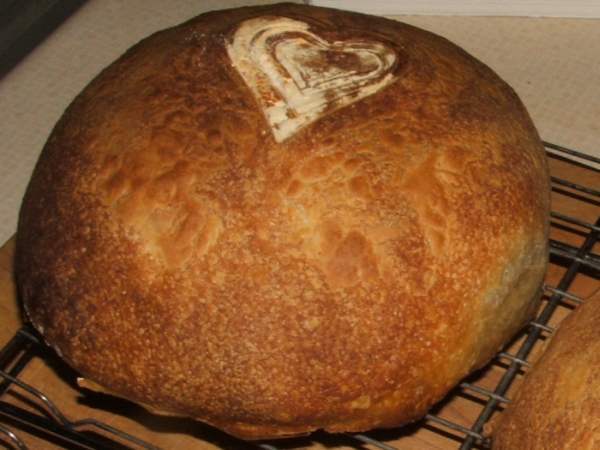 For this loaf, I used 3 heart shaped cutters. Instead of removing them just before baking, I left them there for the first half of the baking and removed them when turning them around to account for uneven heat in the oven. The bread really was outstanding. Wonderfully crisp and chewy on the outside and light and open-holed inside. It's so wonderful when it turns out JUST like you want it! I'll bet you're glowing! Thank you Susan. You're right, I couldn't be happier! I haven't yet had a chance to try repeating the success but I do have a good feeling that it might work out. Bravo! Of course you'll be able to repeat it. Rats. The bread is sour again. I hope you had better success than I, Mamasita. Of course you'll be able to repeat it. I thought I'd be able to repeat it too, Jane. Alas, no. I made it again yesterday. And I thought everything was going along exactly as before. The starter smelled sweet. The dough smelled sweet. It rose beautifully and there were beautiful big holes in the crumb. And yet the resulting bread had a distinctly sour smell and flavour (sorry no photos, I was too dejected to get the camera). Well, it wasn’t horribly sour but it didn't have the thrilling sweetness of the previous success. I think it might be a temperature thing. I didn’t use warm water when mixing the dough and the kitchen was still cool enough that I had to put the dough in the oven (with only the light turned on) when it was rising. In fact, the bread went quite well with lentil soup and various cheeses. OK, I should have shut my mouth! Sorry. I went and read your recipe. That is really weird that it is "sour" because it doesn't look like there is any retarding in the fridge. Mine never gets sour unless I leave it in the fridge all night. I don't like that taste! And when I make bread I always use cold water and let it rise in a normal temperature environment, never warm. I like it to rise slowly and it never gets sour. You have to try again and again. No need at all to apologize, Jane. I foolishly thought that it was finally warm enough in the kitchen to leave the starter on the counter. Ha. Not with this really cool spring we are experiencing.